Gwinnett Business Radio interviews Jeremiah Plaskett and James Willard, partners with Byteworks. We take an engineering approach. We come in, look at the needs, and try to identify what it is that would actually benefit the client most. 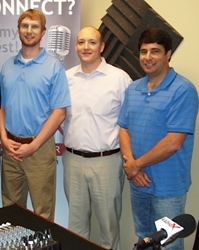 Gwinnett Business Radio's April 24, 2014 episode featured guests Jeremiah Plaskett and James Willard with the IT services company, Byteworks. Co-hosts Steven Julian and Mike Sammond welcomed Byteworks’ tech experts into the studio. The team discussed unified collaboration technologies, a hot trend that includes services like video conferencing and office instant messaging systems. Another trend, and one of Byteworks’ specializations, is cloud technologies. According to Willard, who is also a Byteworks partner, the company not only provides these services but has become known as the company that will fix related problems when no one else can. Byteworks believes in leading with the solution and everything else will follow upon building a strong relationship with the client. To learn more about Byteworks, listen to the entire interview on Gwinnett Business Radio. Each week, from the Gwinnett Business RadioX® studio, Mike Sammond interviews Gwinnett County’s top businessmen and businesswomen to learn what makes them the best at what they do. Gwinnett Business Radio airs on Tuesdays and Thursdays at 10:00am EST. BusinessRadioX® interviews dozens of innovative entrepreneurs and successful leaders each week. Its mission is to help local businesses Get The Word Out about the important work they’re doing for their market, their community, and their profession. With a pro-business slant and a long-form interview format, guests don’t have to worry about being ambushed or talking in “sound bites.” Guests have enough time to tell their whole story and to share their insights and experience without interruptions. BusinessRadioX® hosts are business professionals interviewing their peers, drilling down on the critical issues, and delivering practical information to an engaged business audience. Business topics that are frequently covered include: Law, Finance, Healthcare, Technology, Trade Shows, B2B Marketing, Venture Capital, Training and Development and other issues impacting the business community. For more information, visit: http://www.businessradiox.com.